As we reported quite some time ago, Triumph has been developing 250cc models for production in India, and would join a long list of manufacturers now pumping out small displacement bikes for worldwide consumption. 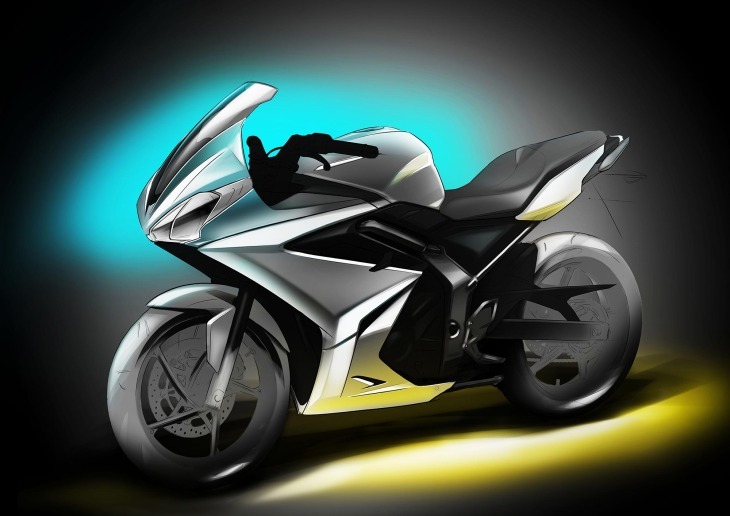 Indeed, Triumph itself distributed the concept drawing shown above in Milan last year. Our guess is Triumph has re-evaluated the performance needed to compete with models such as the Honda CBR300R, Kawasaki Ninja 300 and the soon-to-be-released Hero 250 (tweaked by Erik Buell Racing for high performance). I think we will see Triumph come back with something for this segment, soon. Piaggio USA Announces 2015 BV350 i.e. I’d guess that Triumph has enough strategic vision to see that the lower-displacement end might get swallowed up by the upcoming electric bikes/scooters. The recent story on the demise of Horex is a reminder of how monumental of an accomplishment is the successful rebirth of Triumph. Most of the time, Bloor and his people have gotten it right. I’ve riden my dad’s Honda CB 350 Four a few hundred miles and there is a lot to like about a small displacement, multi-cylinder bike. A 350-375 triple would be very cool. However, cost would make this an impractical choice, especially for emerging markets. It’s hard to see where Triumph can do something that is competitive on cost and aligns with their heritage or current state. A thumper Tiger might be a way to make it work. They way the economy is going 300 cc bikes are a hit..
surprising, so long as they didn’t have any delusions about this side of the pond…? I would think they would’ve done quite well. this has a slight stench of British/Indian politics. If you want to play in this field and are not one of the big 4 or Korean or other… then simply do what you’ve always done as triumph and what KTM did… compete at a different level. Build your own version of a small bike and forget about it. My current bike… 675 Street Triple R… 2012. One of the best middle weights ever! And aside from the obvious problem of dumbing down a luxury brand, the reality is that the place is completely crowded with 250s. How do you make a 250 that much better than all of the Japanese, Indian and Chinese bikes combined, all of whom have a ton of experience in building small displacement bikes? You’re setting yourself up to compete with everyone and also for drawing unflattering comparisons if you don’t absolutely nail it. At least with a 300cc plus bike, you can at least have something that is faster. If you rely on branding, you actually risk destroying the very thing that draws people in. I have seen this over and over in the audio industry when a company shifts direction towards the masses and gets chewed up and spat out. A more-appropriate description of Triumph might be “esoteric” (as opposed to mainstream). Invariably, Government Mandates & Tariffs put manufacturers in the position of making a a motorcycle at 250cc. Let “Free-Marketism” rule and then see what they make! I am a Triumph guy, and my guess it you are right. The 250’s proposed by Triumph would not be very competitive. I would love to see a 375CC Triple, that would be more inline with the Street Triple and Daytona. 250s are just flat out too small and the trend is towards BIGGER bikes in small displacement areas. People want faster, better, smoother. So the SMART place to be is in the 300cc-500cc range with motorcycles that are just a little more. It is almost as expensive to build a 250 as a 350, unless you purposely make the 250 really crappy. And then what do you have? Nothing. KTM is bright for having the 350 and 390 bikes available. Yes, they have 125 and 200cc bikes but I suspect the sales aren’t that amazing. The 200 Duke was 5% of numerical sales, but it appears the Duke 390 quickly matched or supassed that figure despite a higher price tag. Triumph needs to take the 800cc triple and produce a 530cc twin out of it, with Tiger, Daytona, Speed Twin models as a minimum. …but new riders need to start somewhere and providing much wanted “learning” bikes not only does just that but also introduces them to the brand. Triumph’s one of those companies that has to pick its markets carefully. With smaller displacement categories becoming more and more saturated with models Triumph probably recalculated their return on investment wasn’t going to materialize. The smart place to be is 250cc. The US is a minlor market compared to the places where 250cc is a catch weight displacement. If they’re bailing out then they don’t believe their product will be competitive in those markets.